I was befuddled to say the least! 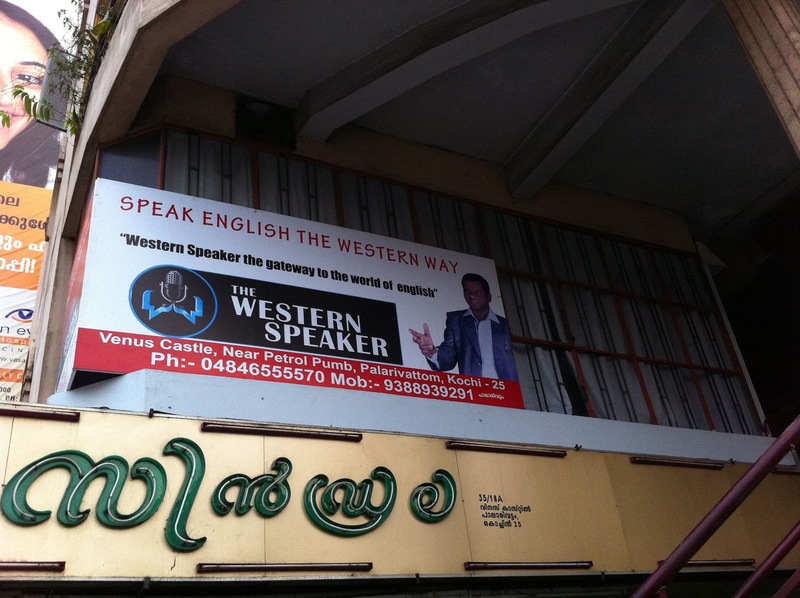 Not only did the Malayalees we talked to not understand my P sound, but in their making the P sound back to my American ear, it sounded clearly like a B. As Indian languages have the alphabets p, ph, b and bh, there are many sounds to distinguish in native tongues. However, English only has two sounds, and we have to assure that they are made clearly so that the native speaker can hear you clearly over the phone. 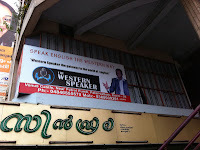 The photo to the right says the office for “The Western Speaker” is next to the petrol pumb instead of pump. This is a clear example of how not hearing the right sound can impact the written English as well. Especially for Malayalees, the mother tongue has a unique letter/sound "imba" ( ). There are two steps to reduce the mother tongue influence to this sound. The first step is to assure we have mastered the p and b sounds, and the second will be described in another post. To help you perfect these sounds, read and watch the following tips below. Flatten your lips like a straight line. All the time your tongue stays on the bottom of your mouth. Do not buzz in your throat. When releasing the sound, drop the jaw and release a little air. To know if you are making the buzz sound, place your hand on your throat. Do you feel the vibration? This vibration should not be made for P.
To know if air is coming out while making this sound, hold a piece of tissue in front of your mouth. If you see the tissue move, you are doing it right. It may move for B, but the movement for P is much more. One can exaggerate this at first by trying to release air only with P and avoid it with B. Can you hear and feel the difference? When spelling a word with the letter “B”, we will say the letter as it sounds followed by “ee” – “Bee”. When spelling a word with the letter “P”, we will say the letter as it sounds followed by “ee” – “Pee”. Saying “pee” or “pee pee” is a slang for “urine”. Often little kids say this before they have to go to the bathroom. Author Jennifer Kumar is a native American English speaker, Managing Director of Authentic Journeys, based in Infopark. For in-person as well as virtual accent and culture classes contact Jennifer today. Want to improve your English Pronunciation with other sounds?